A village in Madagascar has been hit by a deadly outbreak of the bubonic plague, medical experts on the island have confirmed. Tests were carried out after at least 20 people in the village, near the north-western town of Mandritsara, were reported to have died last week. The International Committee of the Red Cross warned in October that Madagascar was at risk of a plague epidemic. The disease is transmitted to humans via fleas, usually from rats. Last year, Madagascar had 60 deaths from the plague, the world's highest recorded number. The Pasteur Institute of Madagascar confirmed on Tuesday that tests taken from bodies in the village last week showed that they had died of the bubonic plague. The BBC's Tim Healy in the capital, Antananarivo, says health officials have now gone to the remote area to investigate. 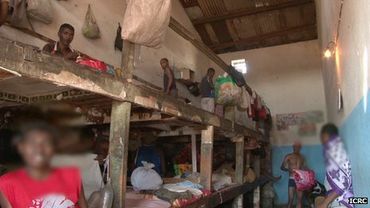 There has been a programme to exterminate rats, fleas and cockroaches in Madagascar's prisons to avoid outbreaks of the plague, which is spread because of unhygienic conditions, he says. The Pasteur Institute said there were concerns that the disease could spread to towns and cities where living standards have declined since a coup in 2009 and the ensuing political crisis. On 20 December a second round is being held of presidential elections aimed at ending the political deadlock. Why should we be interested in a plague on an island in Africa? This is a world of fast travel, a plague can be passed quickly from one person to the next and be world wide in a matter of weeks. The plague was not immediately isolated or identified, so we should know about what is happening and we should be aware of travel. I misspelled 'fluoroquinolones' there.. sorry! The treatment today is available, the recognition of the disease and it's symptoms is not. The average GP or Emergency room doctor may not recognize the symptoms until the disease is far advanced. Awareness is always nine tenths of the cure. Thanks Monica. awful news.. lets hope it is addressed and not allowed to spread..
Madagascar is such a poor nation! It's the most depressing place I've ever visited....uneducated, unemployed, unfed and uncaring people are everywhere. Madagascar has more than one airport and a shipping industry, both mean the disease could easily be carried away from the island. It took a few weeks before the doctors realized that this was Bubonic Plague, it is a rare disease but one that can travel from infected persons. Terrible - I hope they can contain it - that country is already at bottom! Thank you for this article, really terrible news. Thanks, my friend. I was quite concerned when I first heard of this disease rearing its ugly head again. It is truly frightening when these horrific diseases, that we thought were conquered, make a comeback. I hope that it isn't spread farther. We need to worry about it spreading in the "poor" countries. While everyone reads this article, we need to realize that globally antibiotics are becoming more and more ineffective. Please flag the inappropriate comment. Many good points raised here. Effective antibiotics so that people recover, immediate diagnosis, containment. Kit you are right, travel can cause this to spread but not necessarily human travel. The fleas or the rats would have to move. But that can and does happen. It is so difficult to diagnose some fo these diseases as so many thing present in a similar fashion. Right now, we'd think flu not plague. Hopefully healthcare providers over there will realize sooner. Once again, Kit is right. The healthcare practitioners' awareness about this rare but fatal disease is the key point in preventing such outbreak from reaching high numbers of mortality. And very true, Betsy. Antibiotics are becoming more and more ineffective, and in my experience, we owe that in part to inappropriate prescribing from doctors and also the patient's own non-compliance to their doctors' advice about the appropriate way to use antibiotics.